I am so far behind in blogging it is hard to know where to start. 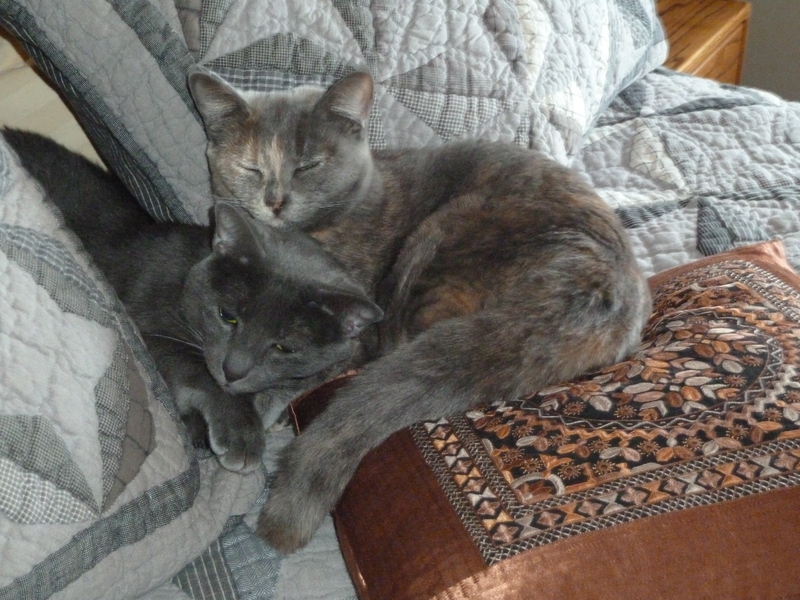 Part of it is laziness, part of it is lack of picture-taking. I don’t know! Anyway, since we last met in early December, we have been to Seattle for a week for the holidays, and then settled back in over here in early January. I have a new spinning wheel! It is a Jensen Tina II and belonged to a friend of mine in Seattle, who bought it in 2002 but hardly used it. The finish was rather dry, so Rick put 2 coats of Profin on it and now it looks wonderful. It spins like a dream. Distaff Day, also called Roc Day, is 7 January, the day after the feast of the Epiphany. It is also known as Saint Distaff’s Day, one of the many unofficial holidays in Catholic nations. 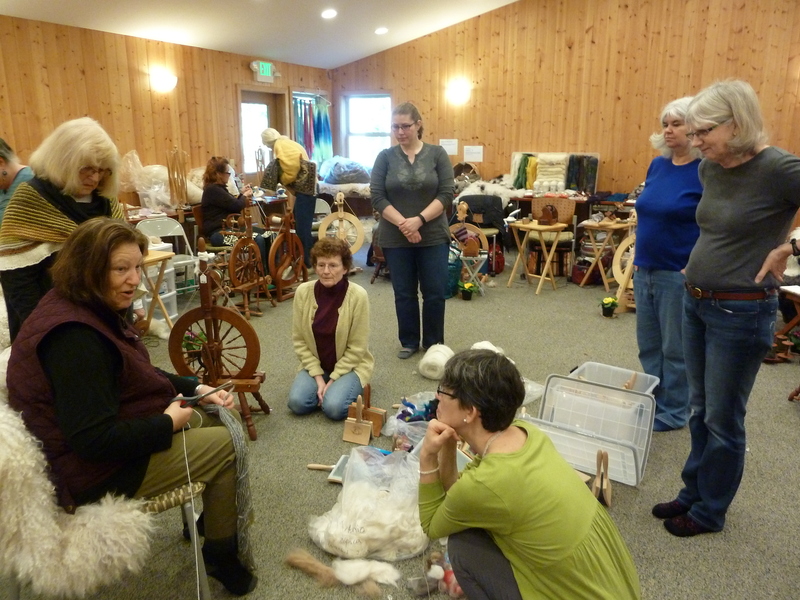 Many St. Distaff’s Day gatherings are held, large and small, throughout local fiber communities. The distaff, or rock, used in spinning was the medieval symbol of women’s work. We have lots of snow this year. It is going to be the best ski season, maybe ever! The folks at Methow Trails are keeping it well-groomed as always. We have one of the top Nordic ski trail systems (120 miles or 200+ kilometers) in the country right here in our little valley. It is divided into four areas, all connected by the Methow Community Trail. I have been knitting more Mosaic Mojo hats. Still haven’t gotten tired of these yet, as long as I have nice yarn to work with. 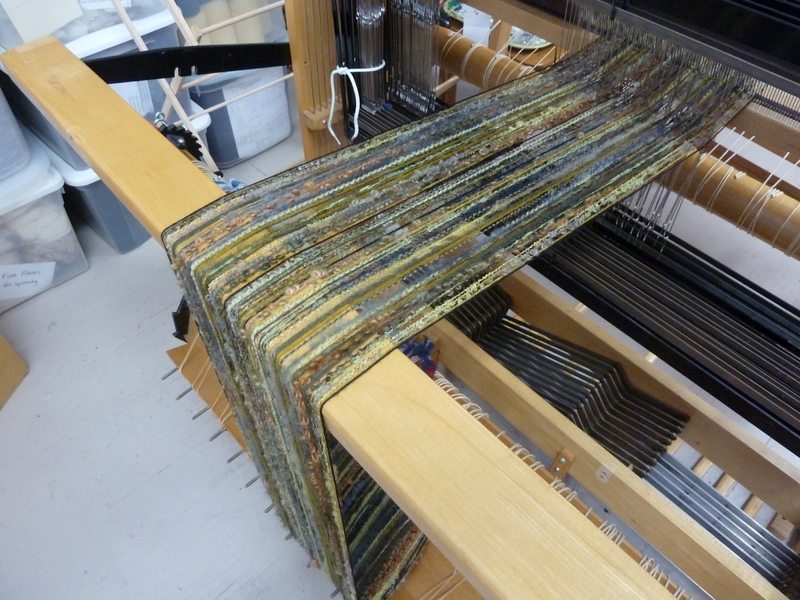 A week or so ago I put a scarf warp on my 32″ Macomber loom, using some Missoni “Bombay” novelty yarn that I picked up at a stash reduction sale, and some rayon rik-rak on cones. I put 21 yds on the sectional beam, enough for 10 scarves about 70″ long plus fringe. Finished the last one yesterday, washed them and cut them apart, and they are hanging to dry. Pictures to follow! This past Saturday, we had our annual community association progressive dinner, which is always held on the ML King holiday weekend. I was the organizer, and we hosted the main course at our house this year (appetizers at one house, main course at a second house, desserts at a third). There were 41 of us and it was a challenge to fit it into our dining and living room! We moved most of the living room furniture out to the shop or upstairs, set up 5 tables, and borrowed a bunch of folding chairs from the Winthrop Gallery. Lots of fun! 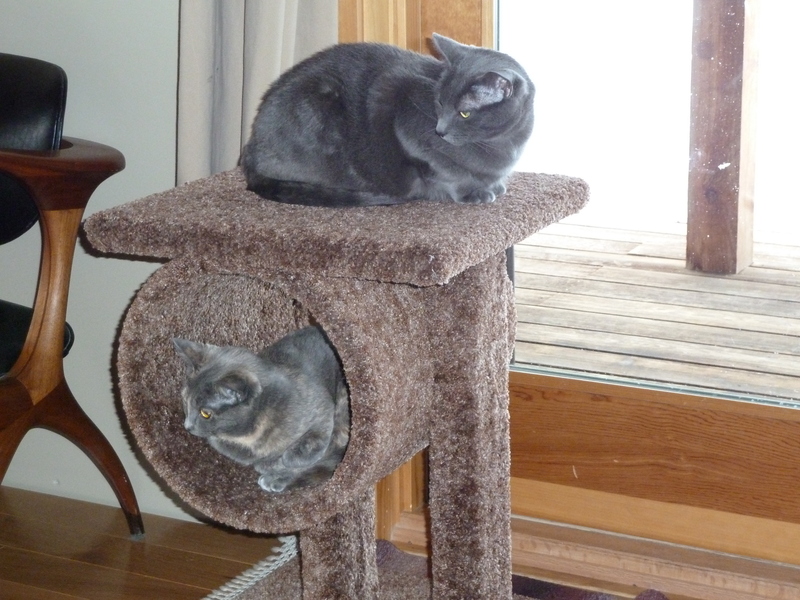 This seems to be a social time of year – we have had many get-togethers with friends and neighbors since returning home at the end of December. 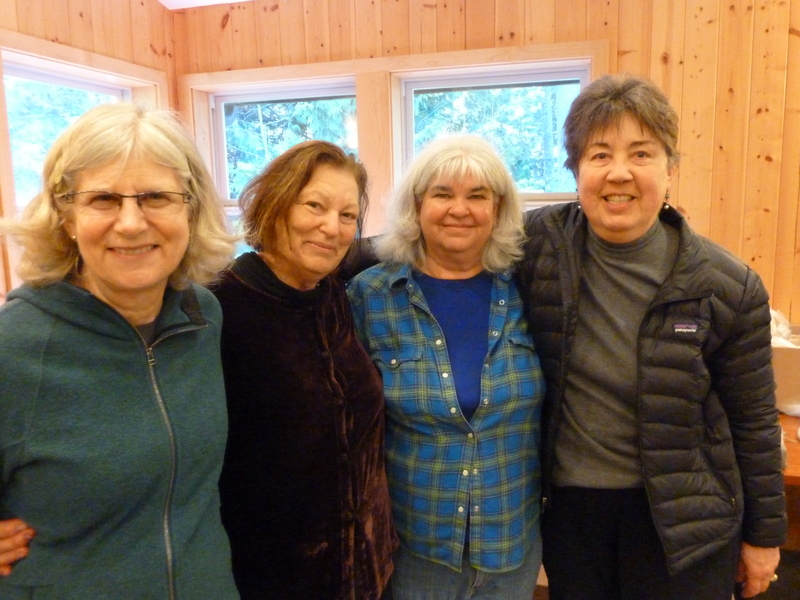 It’s been about a month since I went to the spinning retreat/workshop on Orcas Island with 2 friends from the valley. I had missed the last 2 years so it was great to be back with Judith MacKenzie as our excellent teacher and mentor, and an interesting group of women. There were some familiar faces, and some new ones as well – one group of 4 came all the way from Indiana! The theme this year was “Wit, Wisdom & Wool” but basically it was trip around the world to explore various fibers. A lot of these were fine fibers such as yak, silk, camel, etc. and my friend Jacquie, who is a new spinner, really was thrown in the deep end. 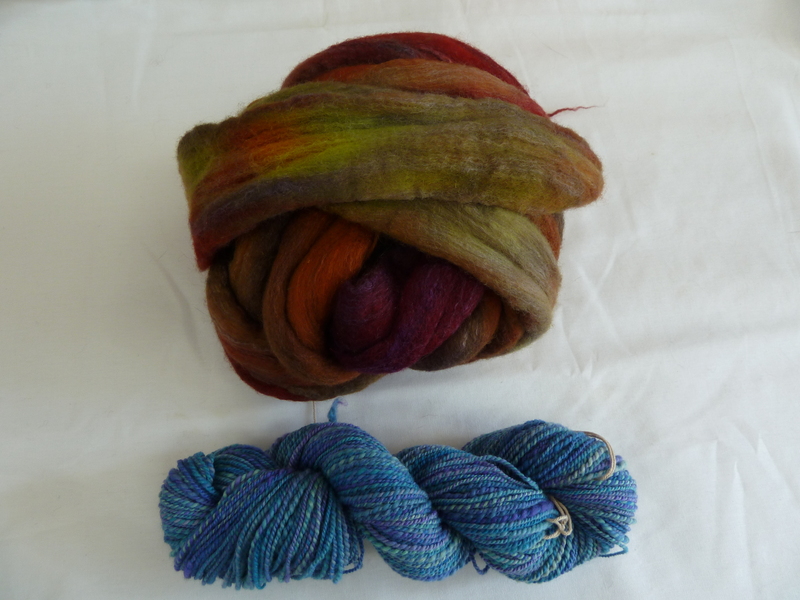 It was a good review for me for things I had encountered in previous spinning retreats, especially since worsted draw isn’t my strong suit. 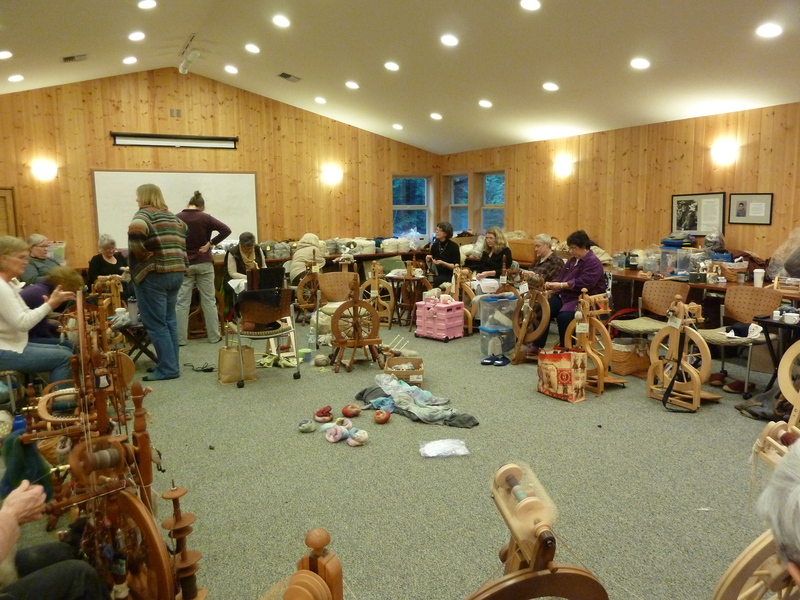 Here is a general view of the room – spinners, fiber and Judith! We started with 100% yak (Himalayas, Tibet, Mongolia) and were shown several ways of spinning the top. 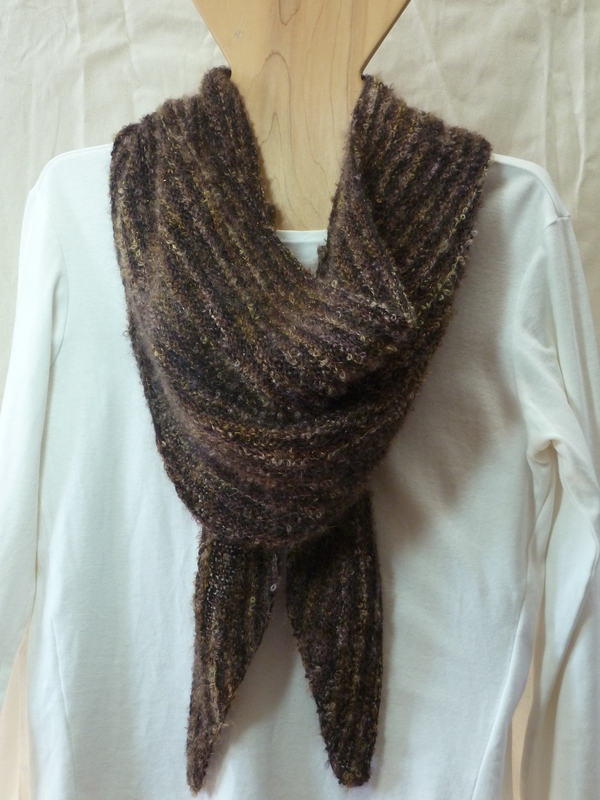 Later I also tried a yak/silk blend that is yummy. The yak fiber is a soft gray color. On day 2 we went on to a camel/merino/silk blend and then some 100% baby white camel, plus what Judith said was “adolescent” camel – not truly baby. Of course, all of this is accompanied by many wonderful and informative stories about the nature of the animals, their history, and how important they are to the lives of the people who live with them and use all of their products. This was definitely the “wit & wisdom” part of the week. 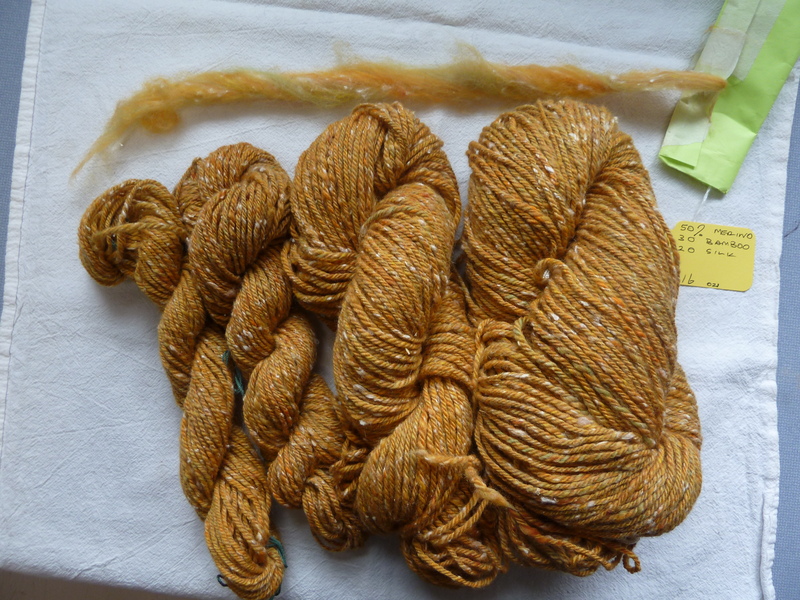 Then we moved on to silk – 5 different kinds, to be exact. Eri is a wild silk from Tussar, India and is gotten from spent cocoons (that is, the fibers are shorter because they allow the worms to hatch and eat their way out of the cocoon, which breaks the continuous thread). This is a rare and hard to get silk- it was white. Muga silk is a wild silk from India and also very rare – it was a lovely honey color and has a lustrous, reflective surface. I found it easier to spin than the eri and some of the others. 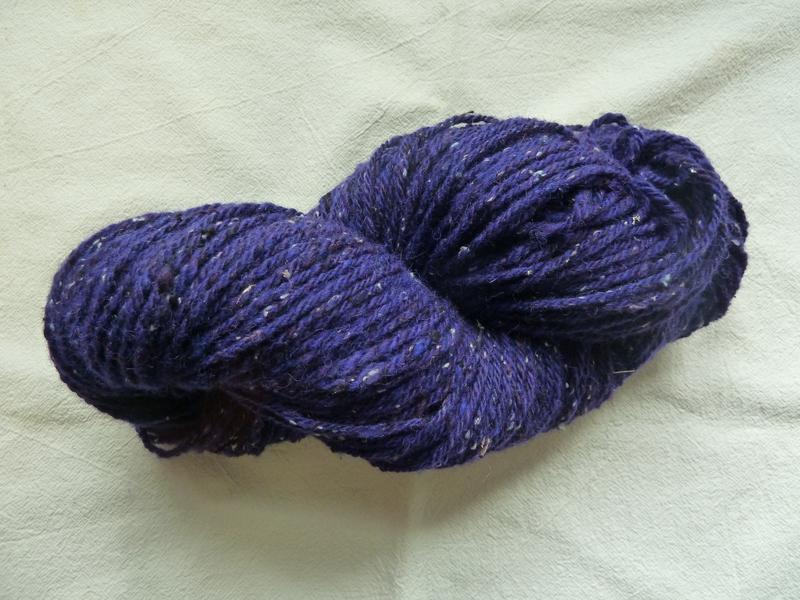 There was a dyed black tussah silk from India which was kind of coarse, I didn’t care for it. White bombyx silk (cultivated) was finer than any of the others and a challenge to spin. 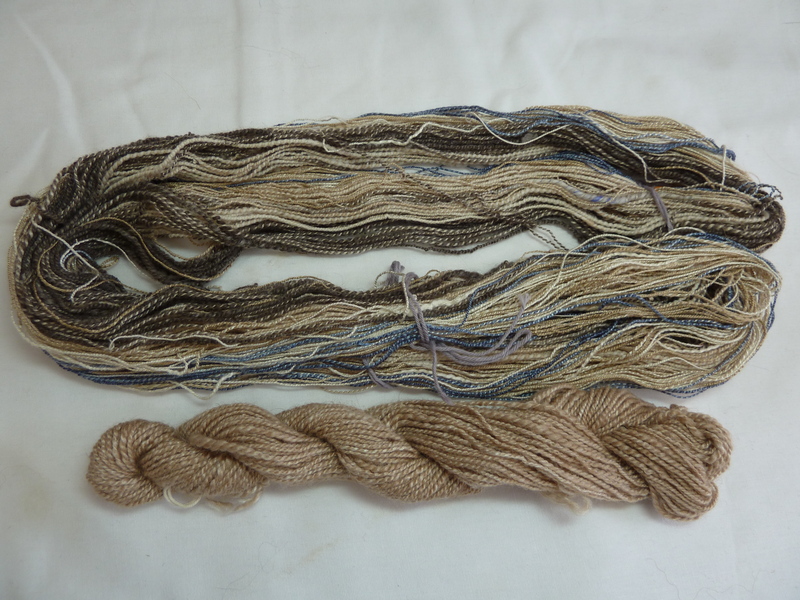 There was a natural color tussah (wild) that was quite nice, and finally some dyed bombyx that Judith had dyed an indigo blue. On the third day we had a diversion into a color gradient exercise. We used cotton hand cards to open up and prepare a solid color dyed merino top (the hue). The hue was blended on the hand cards with white (for a tint), gray (for a tone) and black (for a shade). These were spun into singles, and then we made all the possible 2-ply combinations of each to see what different yarns could be achieved. It was fun! 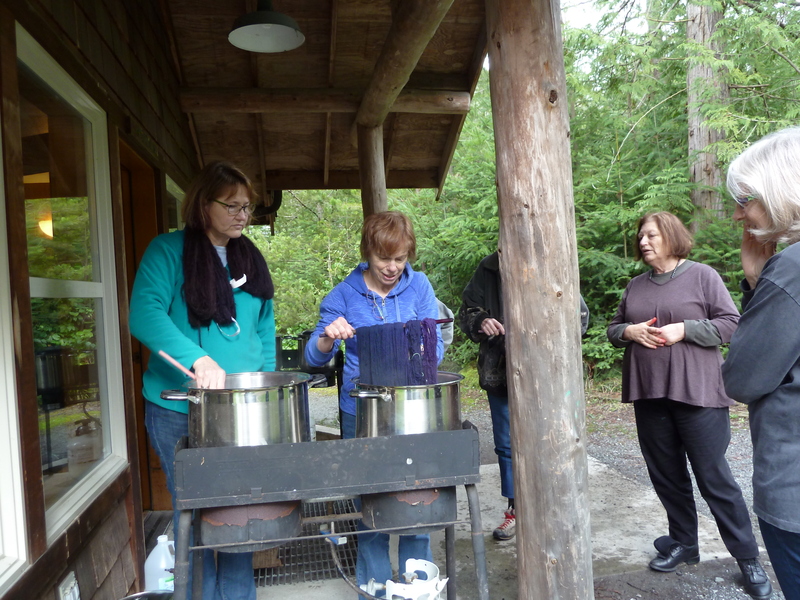 By the fourth day they were getting the dye cabin going. People brought all kinds of things to dye – ugly yarn to made beautiful, spinning rovings, sweaters than needed a change of color, you name it. This is always a part of camp. I brought some Corriedale roving from home – it came out a little felted and I need to figure out how to disturb it less if I continue with this at home. I also dyed some Polwarth/Silk top and that turned out pretty well! 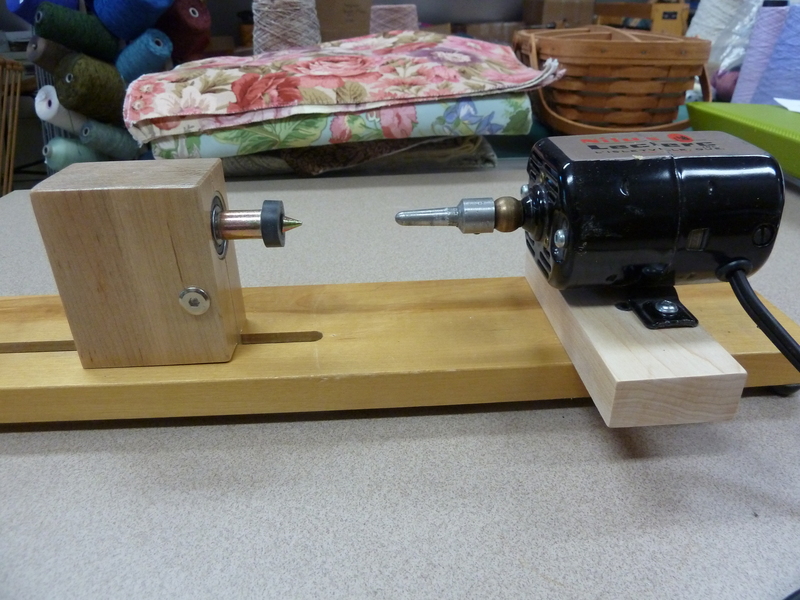 They also had three electric drum carders set up so we could make mixed fiber and color batts to spin. 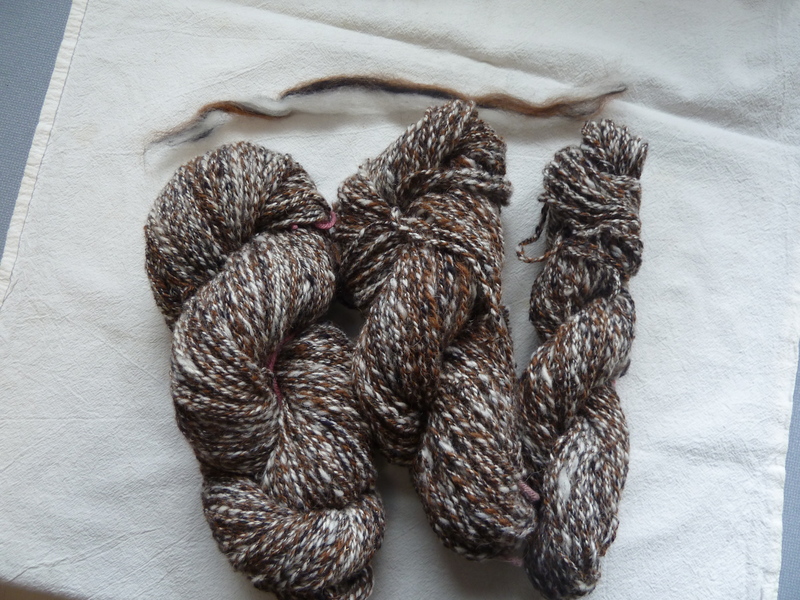 The next stop was Australia and a chance to try Polwarth, a Lincoln x Merino cross. Lovely, long & silky fiber but with plenty of crimp too. I am in love. Then we moved to South America and alpaca fiber. Judith brought a whole haucaya alpaca fleece that we could sort through, and also an alpaca/silk blend in roving form. 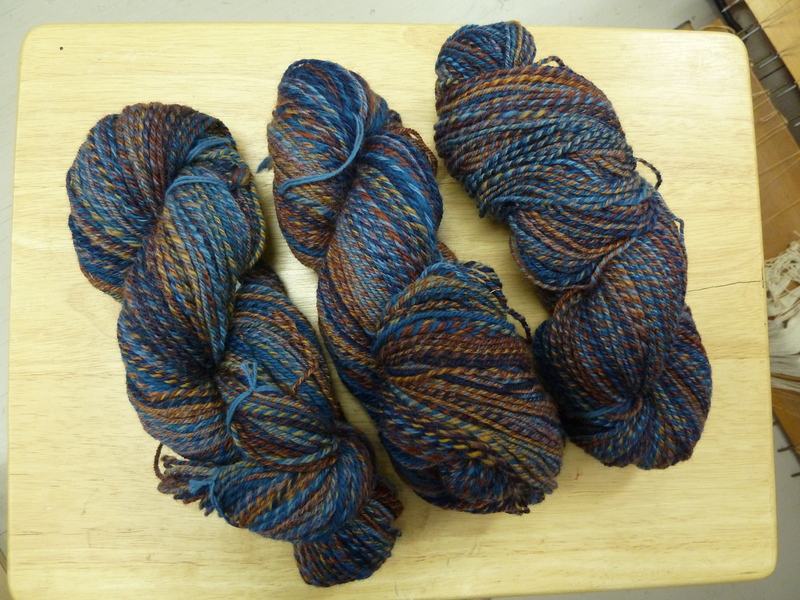 yak, silk, camel spun in class, then made into a random 2-ply to become – something! 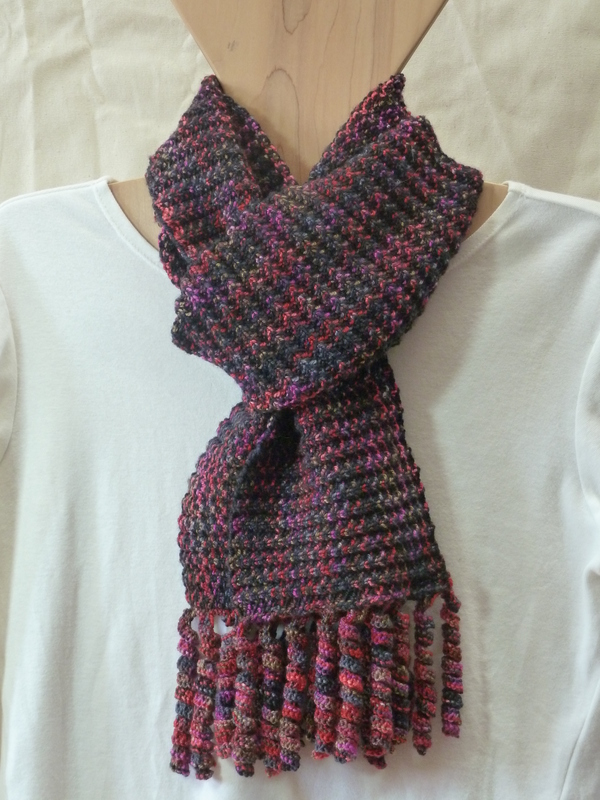 I have been working on some scarf ideas that may make it as far as the pattern stage. If not, at least it has been fun to “unvent” some things, and to bring along at least one project that has been languishing for quite a while! 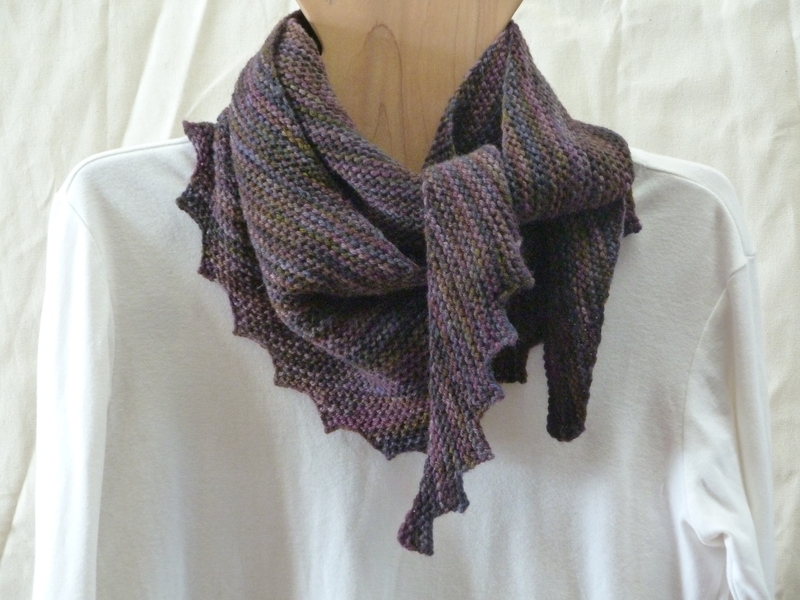 First up is a 3-texture shaped scarf using a lightweight wool, a light mohair with glitter, and a lightweight kid mohair boucle. I also shaped the tails, as I dislike fringe and wanted something more graceful than just a blunt end. 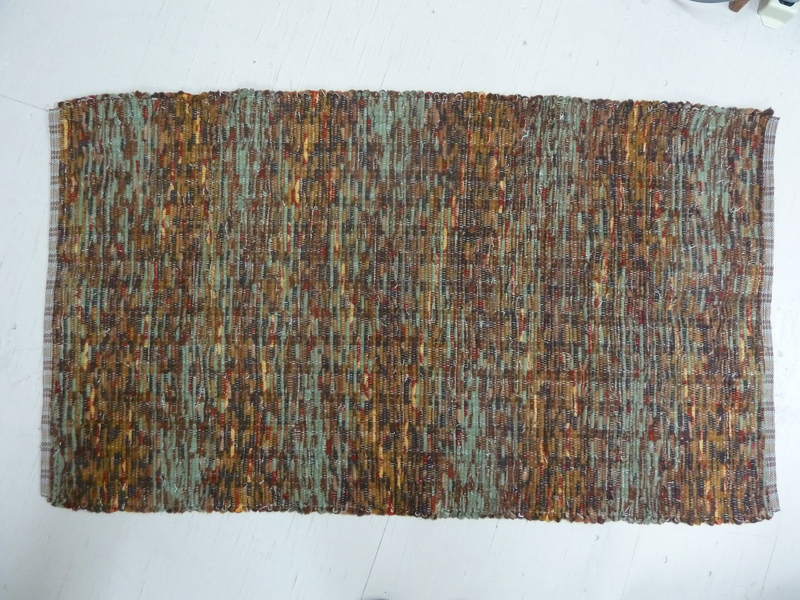 Working title: Sedimentary Scarf (because this one reminded me of sedimentary rock layers). 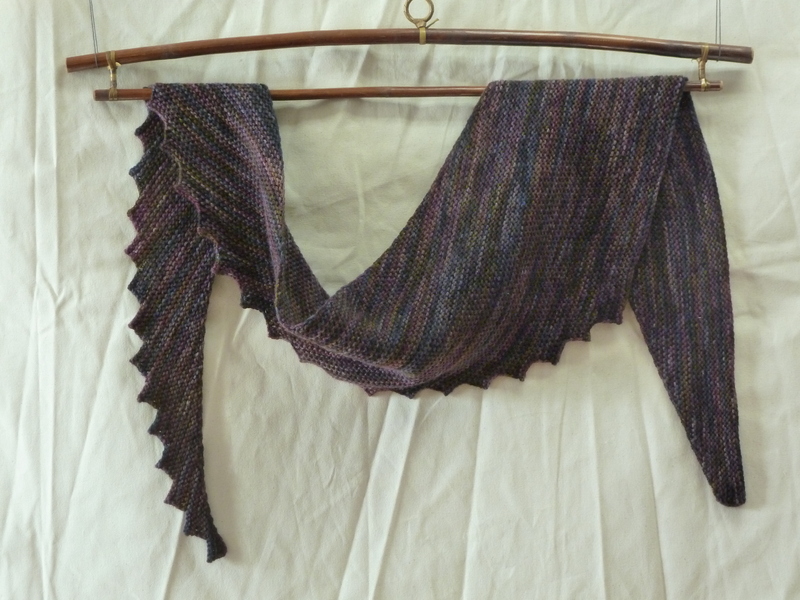 The long tails came out WAY too long, so I have artfully pinned them up behind the drapey cowl part for the picture. Next one will hopefully be “just right”. I do love the colors in this one, though. Next is a project I started a couple years? back. 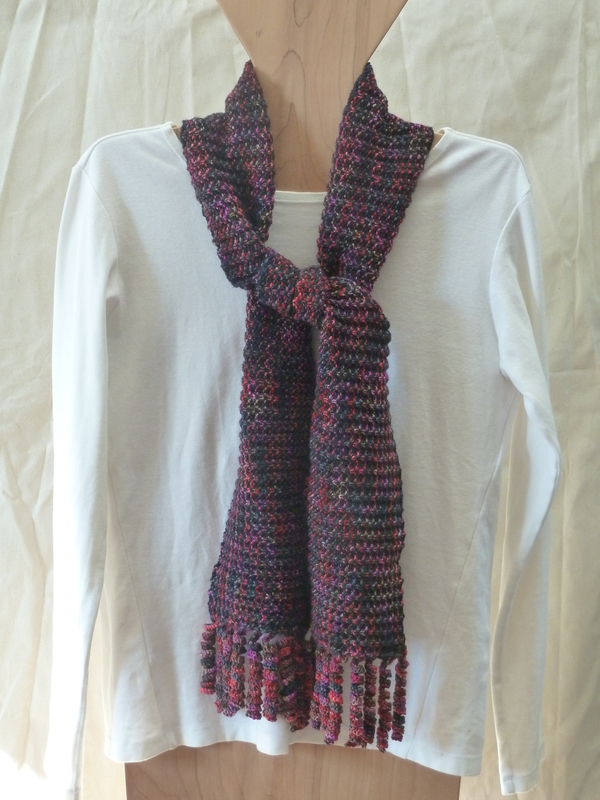 It is a slip stitch pattern scarf (but not linen stitch) with attached corkscrew edging. 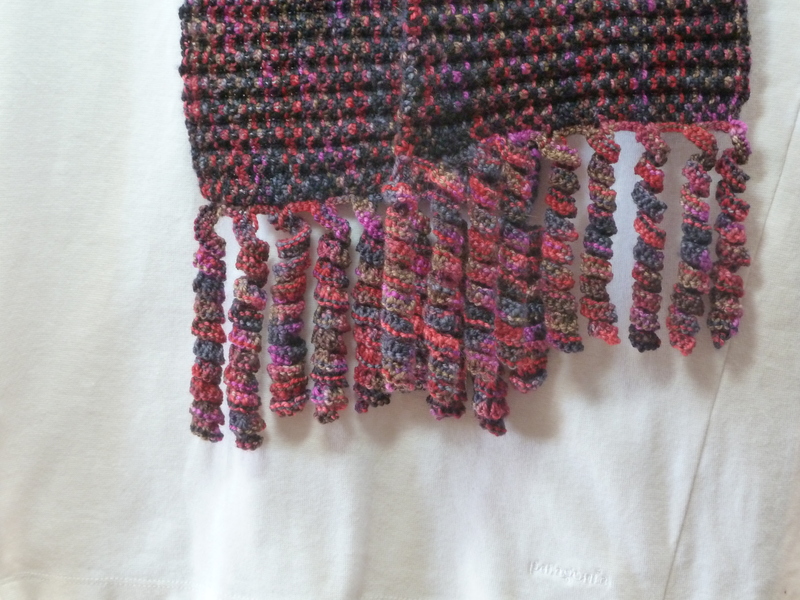 The first time I tried the edging, which came from Nicki Epstein’s excellent “Knitting on the Edge” book, they were knit individually and then sewn on. Not fun mainly because of there being way too many ends to darn in when done. I came up with a modification that lets me knit them as I go across each end of the scarf (this is after the body of the scarf is finished). 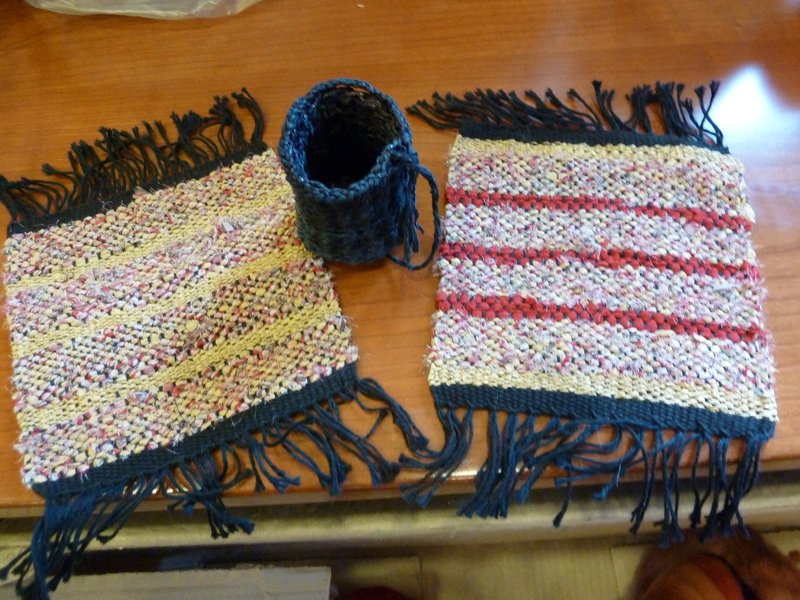 I had two scarves knitted in quite different colorways, but had never finished the edgings. Well, the first one is done now, and I am working on the second. Working title: Corkscrewy. If I put these up on Ravelry, there will be a Big Announcement here on the blog! I also finished a version of Hitchhiker by Martina Behm. This is written for sock weight yarn, but I had been given a “challenge” skein of Mountain Colors Weaver’s Wool Quarters last fall (350 yds in 100 gm, DK weight). 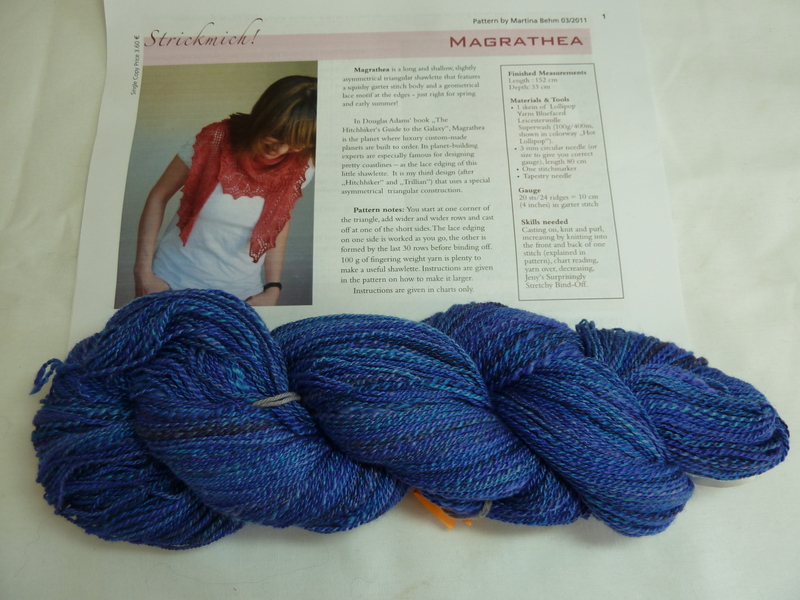 Actually a small group of us were each given 1 skein of this yarn with the challenge being to bring back something made out of it next October. So I just knit away on a size 7 needle until I ran out! It is definitely big enough to wear as a neck scarf, so I am pleased. I have also been spinning up some of the rovings I bought at Taylored Fibers in Quilcene WA, on the Olympic Peninsula, last fall. I am building up a stash of roughly worsted weight handspun yarn to use as pattern weft in some shawls I want to do for my show at the Winthrop Gallery that opens at the end of May. Which brings us to weaving! After two months away from the looms, I am happy to say I put a new mixed warp for scarves onto Kingston this week, and am starting to weave again. This colorway reminds me of the colors and textures you see in the rainforests on the Olympic Peninsula of Washington State. 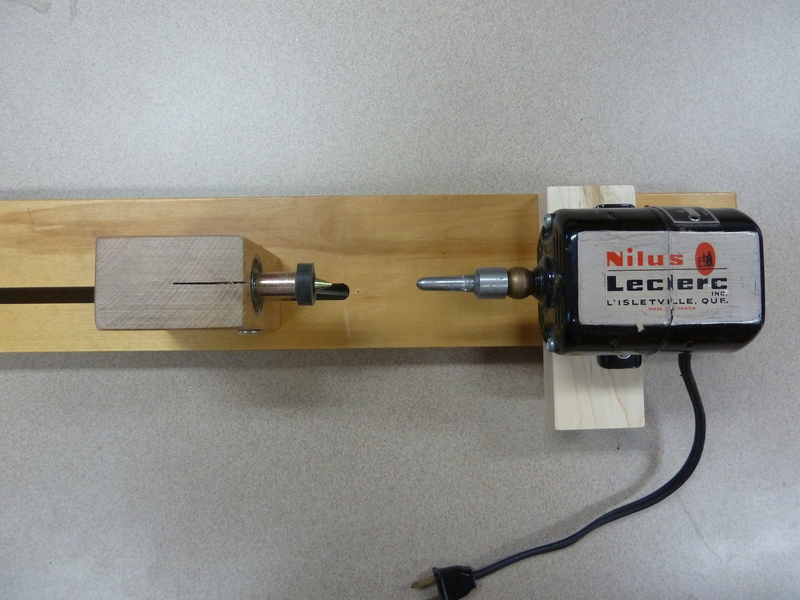 Several months ago someone gave me part of an older Nilus LeClerc double-ended electric bobbin winder. She had gotten it years ago with a loom purchase, but “some of the parts didn’t make it into the box”. Specifically, it was missing the end that slides in a groove, and the rheostat foot control. I tried to get the missing part but the people at LeClerc (in Quebec) said this was an older style and they don’t keep spare parts for older machines. Studying the pictures on their website, I could see that the new ones have the spring mounted down in the groove, not on the shaft of the part that slides in the groove (which is what this one would have had). So I figured I was out of luck. At the ANWG conference at the end of June, someone was selling some old weaving equipment in one of the booths. 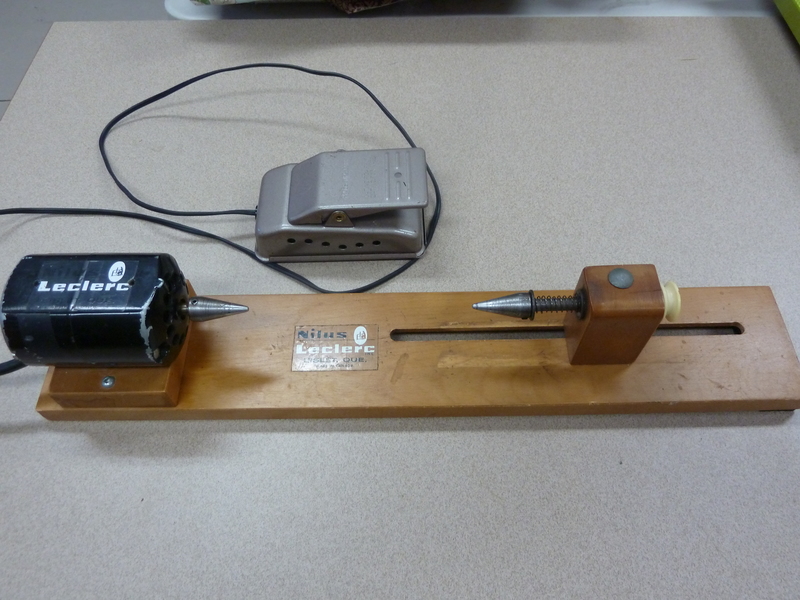 Among this was an older Nilus LeClerc double-ended winder. So I took a chance and bought it. I should have been more careful in checking it out, because when I got home the foot control (wrapped up and taped in paper) was broken. However, I could get it fixed at a sewing machine shop in Wenatchee, although as it turns out Rick was able to take it apart, bend a flange back into place, and put it back together all cleaned up and oiled. So now I had a working winder! You can see how the spring is mounted in this picture. The moving part is tightened down with wing nuts from below, once positioned in the groove for a particular bobbin length. In the meantime, I got to wondering if LeClerc couldn’t sell me a new base plate and moving end from their current model. So after some back and forth with calls and emails, they agreed to this and it came last week. Or at least, they sent the moving part and a spring – not the base with the groove! I guess I didn’t communicate clearly what I was expecting. However, I am fortunate to be married to a guy who is both handy and handsome (a Red Green Show reference). 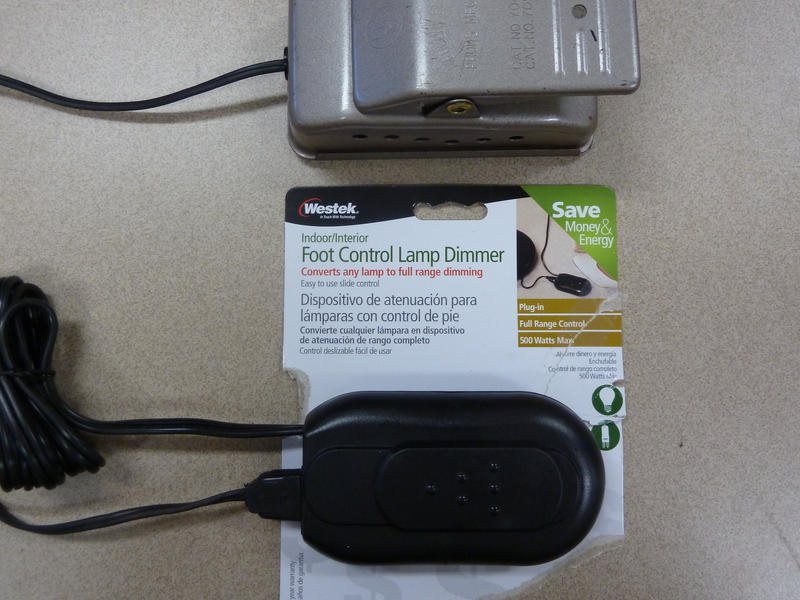 I still have to get a foot control, but the sewing machine store in Wenatchee says they have a box full of old used sewing machine rheostat foot controls with plug for motor and light that I can get for $10-$15 (just like the one on the ANWG conference one, which I have been using for now). 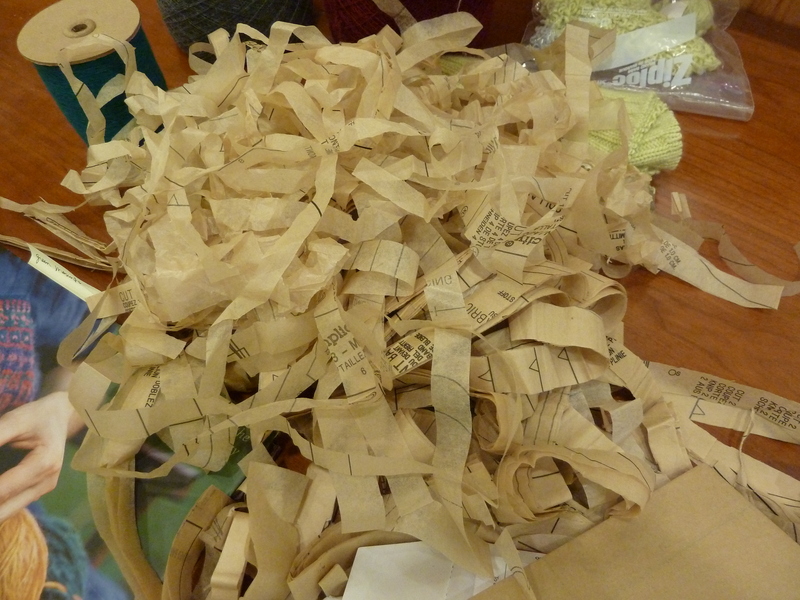 Now I have been using it to wind off spun singles from my spinning wheel’s Woolee Winder bobbin onto plastic spools. I learned this from Judith MacKenzie – spin all your fiber and put on plastic storage bobbins as you go, then ply from those bobbins. Saves a ton of money on extra spinning wheel bobbins. But the electric winder goes like a bat out of hell, and I had to just barely depress the foot pedal to keep it slow enough. Otherwise the spun singles would break – they are a lot more “tender” than weaving yarns you would wind off a cone onto a bobbin. 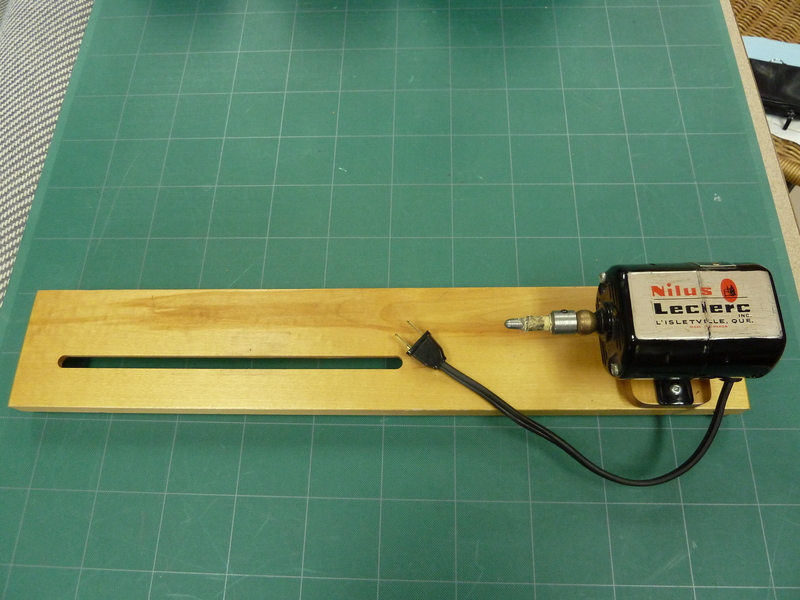 It was hard to control the speed, and when I was done, the foot pedal itself was really hot. It totally solved the problem. I plugged the dimmer into the outlet, plugged the foot control into the dimmer, then adjusted the sliding control until the winder was turning at a slowish speed with the pedal fully depressed. 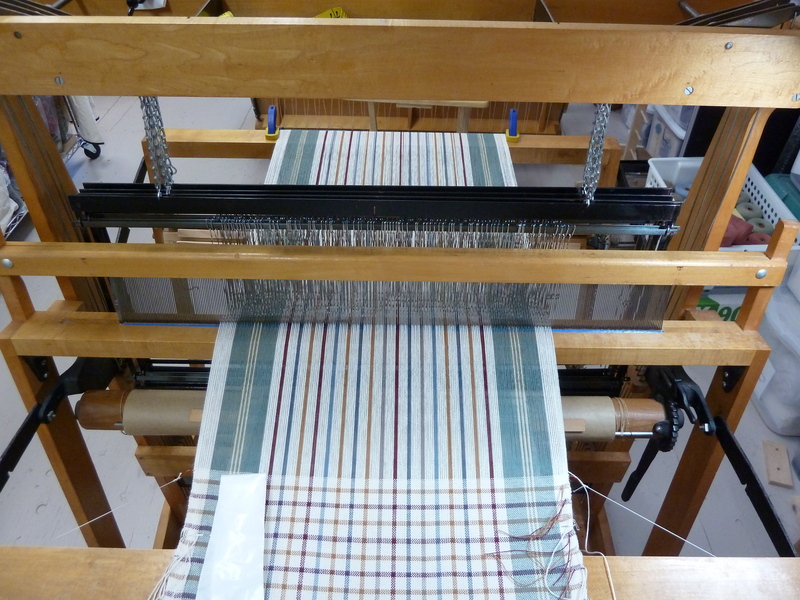 The speed stayed nice and constant so I could concentrate on tensioning the yarn and filling the bobbin evenly. The foot pedal wasn’t hot at all when I was done. And this item only cost about $11! So now I guess I will try to sell the one I got at the conference, and keep the “hybrid”. Final note: 4 rugs finished this week. The first three were an order from friends for their home at Lochaerie Resort on Lake Quinault – Chris picked the materials from my stash of Pendleton selvages when they were here last April. No, not me! I may have had a little too much Thanksgiving dinner, but it’s not THAT bad…. 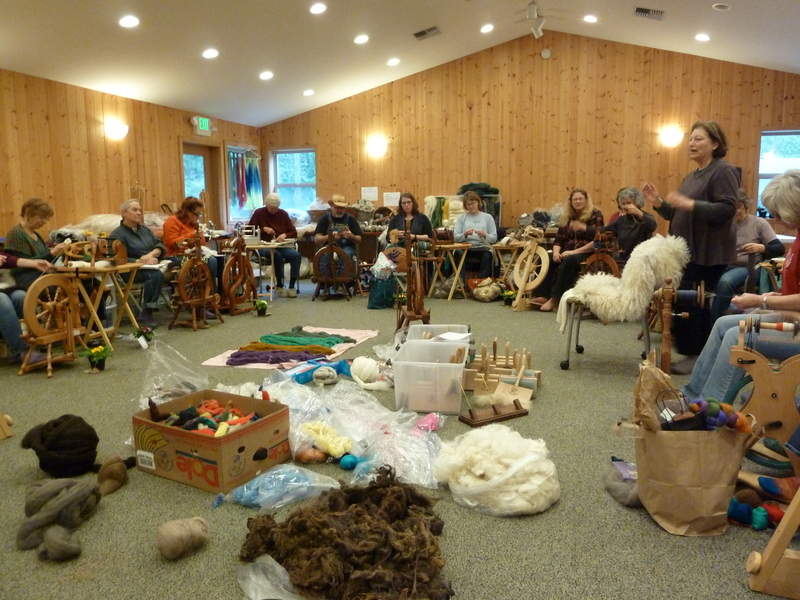 Back in February 2010 I attended spinning camp on Orcas Island with Judith Mackenzie, and the theme was “Ethnic Spinning and Knitting: Cowichan, Aran and Icelandic.” We spun Icelandic fleeces for Icelandic lace or the more bulky Lopi-style knitting yarn. 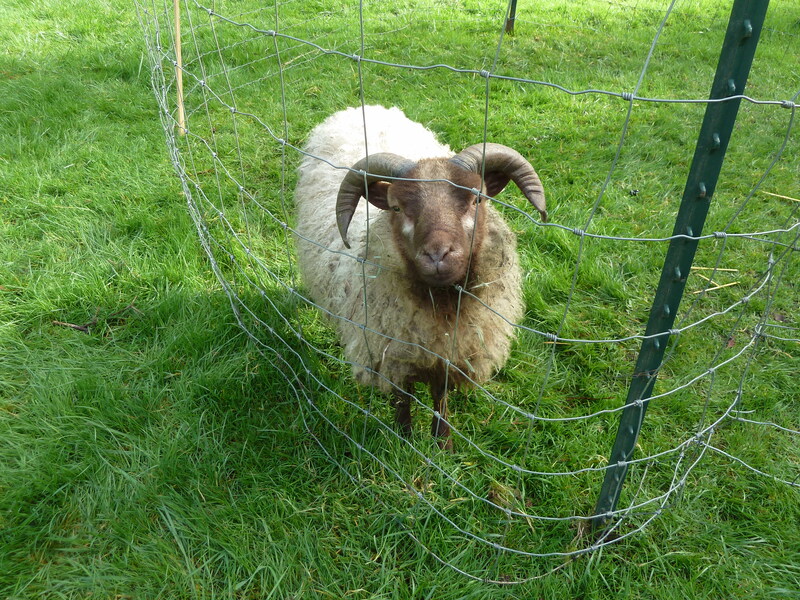 We spun Clun Forest wool to make a 5-ply yarn for traditional Aran sweater knitting. And we spun on an Indian-head spinner to make the loose, thick yarn used for Cowichan sweaters. Later that year we took a trip to Sacramento, CA to attend my niece’s wedding celebration. On the way down we camped in our pop-up trailer. From Mt. Lassen NP we went through Chico, CA and in an antique mall there I spotted an Indian-head spinner! There had been a fire at the antique mall about a year earlier, and it was sitting forlornly in a back room all covered with ash – they hadn’t even bothered to clean it off. I was tempted but didn’t buy it that day. But it kept calling to me, so on the way back north we stopped into Chico again and the bulky spinner came home with us. Since then it has just sat in my studio. Last week Rick took it down to the shop and really cleaned it up – put on new finish and everything. It is beautiful! Looks like black walnut. Underneath the treadle he found the maker’s mark. It turns out these wheels were made by Sid Sharples and another man in California in the 1970’s. They are retired now. 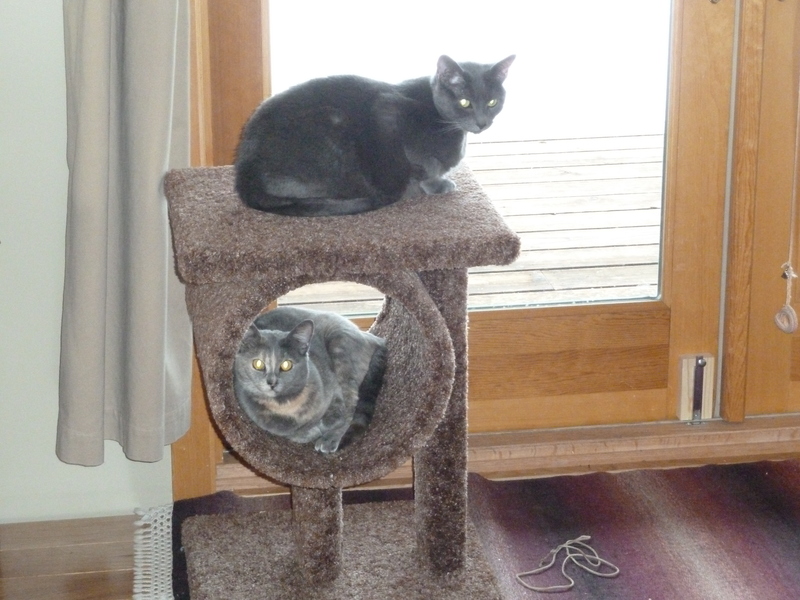 They were made from black walnut or dark maple. It was called the California Bulky Spinning Wheel and also known as a “Cowichan Spinner”. I have found a few pictured on blogs or Flickr on the web – and one was listed on eBay last January, but the guy didn’t get any bids on it. As an added surprise, I was talking to my friend Sara down in Twisp last week, and it turns out she used to have one of these – it was the very first spinning wheel she owned! So now it is going to live with Judith Mackenzie. Why? Because my teacher and mentor in all things spinning, weaving and generally fiber-related suffered the loss of her ENTIRE STUDIO due to a catastrophic fire in Forks, WA in late October. I mean everything (it was a teaching as well as a personal studio). Looms, spinning wheels, all kinds of related equipment, not to mention all her fiber (fleeces, yarn, etc). Due to the age and nature of construction of the building she was unable to get an insurance rider. Check it out – and donate a little if you feel so inclined, to help this wonderful woman recover from a real blow. I found out a week ago that I am leaving on an Adventure with one of my best friends. 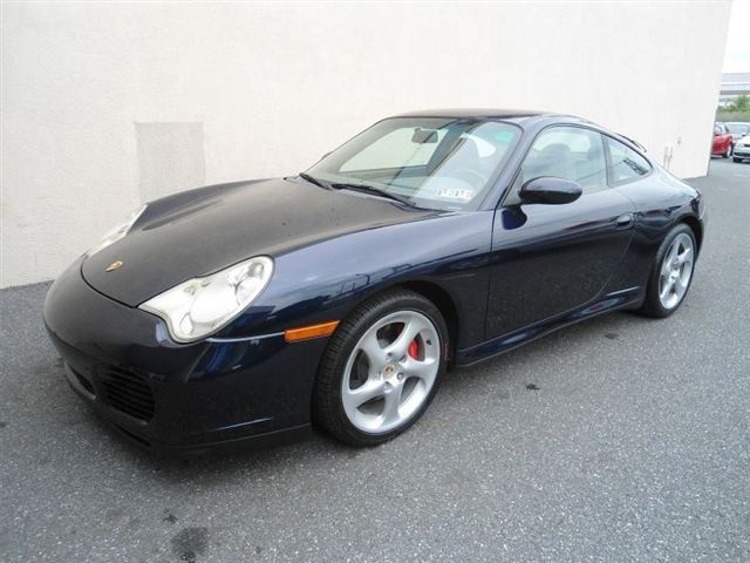 She just bought a pre-owned 2004 Porsche Carrera S but it is located in Lancaster, PA and she wants me to fly back with her to drive it cross-country to Seattle. So I am leaving this evening from the Wenatchee airport to join her in Seattle. We will fly out of Seatac to Philadelphia the next morning, and will be gone for about a week. The plan is to come back via I-90 and she will bring me home to the Methow on her way through to Seattle. It’s a tough job, but someone has to do it! A number of people have remarked it sounds kind of like the movie “Thelma & Louise” – but hopefully without the driving-off-the-cliff part at the end. 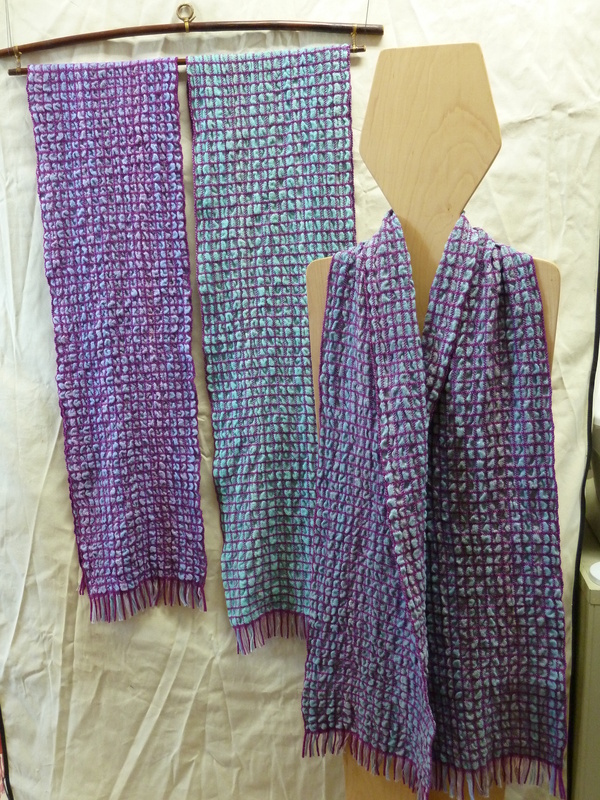 I finished up 3 more of the collapse weave scarves – the warp had soft blues, greens and pinks for the cottons with a dark hot pink (“Chanel”) for the wool grid that shrinks more than the cotton and causes the puckering. 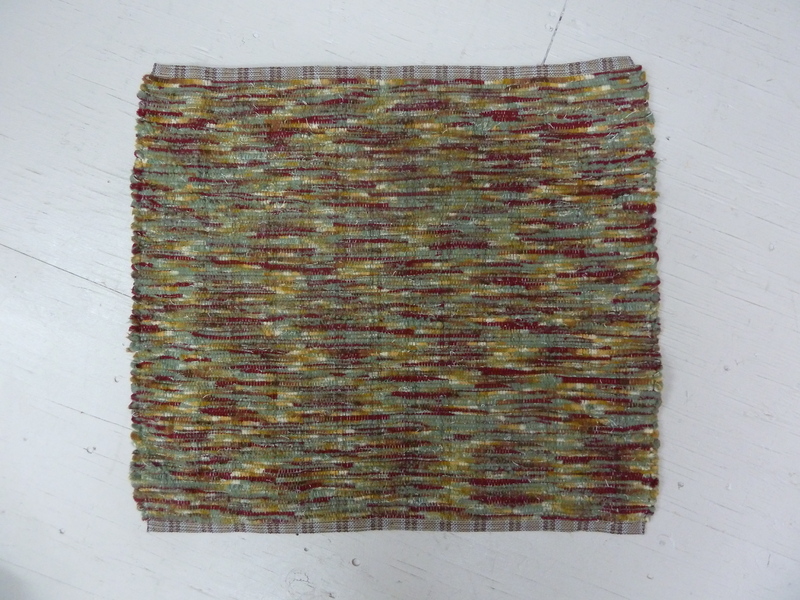 The weft colors were lavender, turquoise, and a soft blue-green. I also finished spinning and plying some dyed New Zealand Corriedale that I bought at least 10 years ago from a place in Victoria BC. The preparation was interesting – it looked like a roving in the bag, but was actually a narrow batt with stripes of about 6 colors running side by side the whole length of it. I didn’t want to spin it from the end and risk having the colors get all muddied, and I also wanted a more woolen, rather than worsted, prep. So I tore off about 1-ft sections of the narrow batt, spread it out, then rolled it from the end to something like a rolag (warning … spinning terminology). 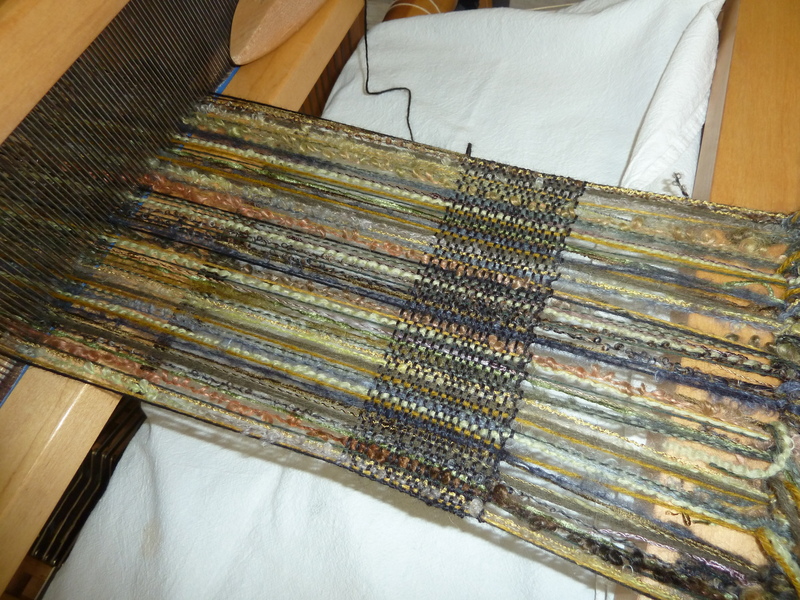 Then spun it from the end of the “rolag”, after attenuating the fibers a bit. So for each of these “rolags” I was spinning across the colors, so they came and went in the singles in a more or less regular pattern. Clear as mud? Then I made a 3-ply yarn and just let the colors from the singles work against each other as they came without trying to plan that part out very much. I am quite pleased with the result! 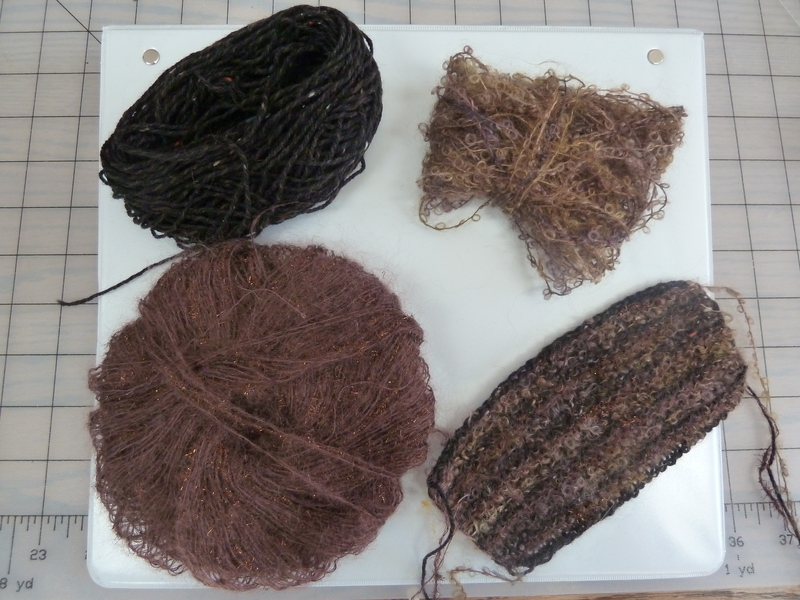 We took apart thrift-shop cashmere sweaters and experimented with re-using the yarn in various ways. We spun paper! Judith had an article about this in the Spring 2011 Spin-Off Magazine. 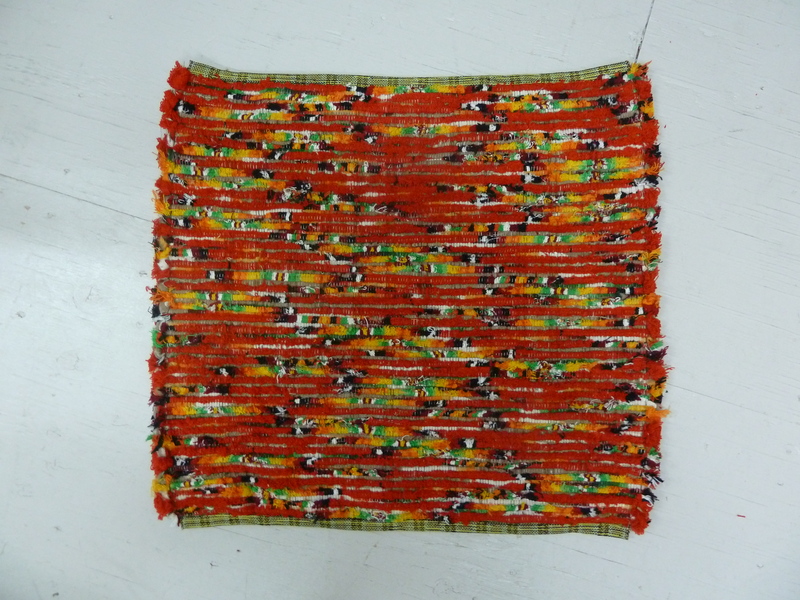 I liked the end result used in weaving, or for baskets, the best. We were also given cashmere, camel, bison, angora bunny, and pygora goat fiber to spin (some of these in different blends, e.g. with silk or with merino wool). 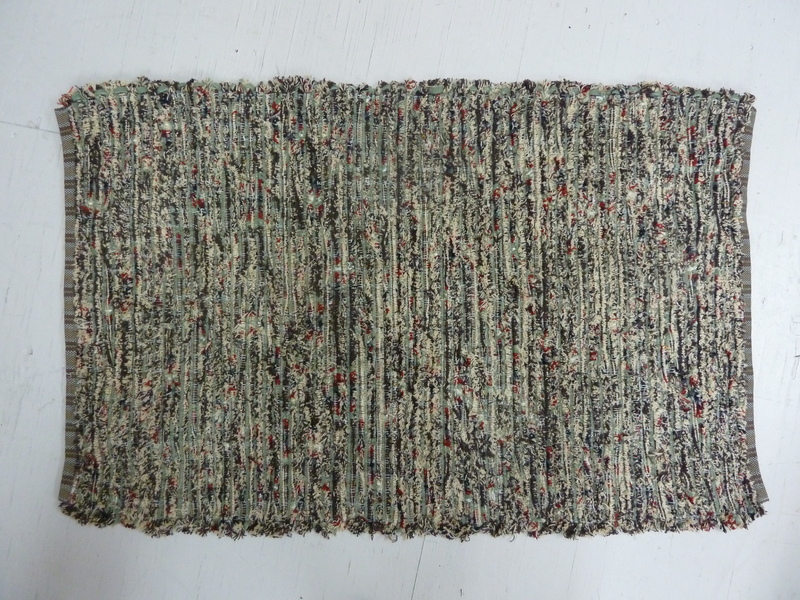 On the last day, Judith made a boucle yarn with recycled cashmere and pygora type A fiber. 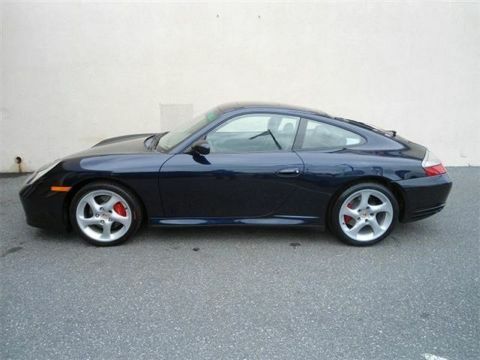 Definitely going to be pursuing this one. There was also dyeing going on in the cabin adjacent to the meeting room. 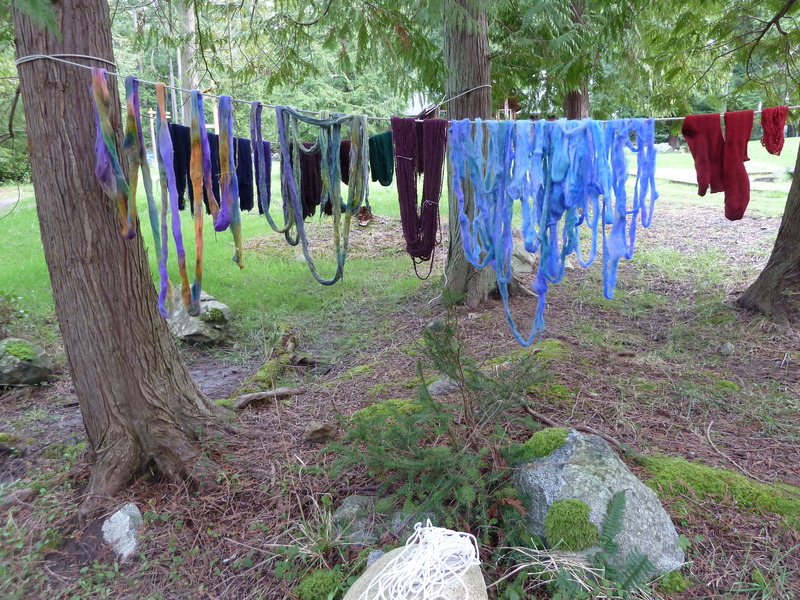 This year it was mainly dyeing with various lichens, and with indigo, although there was a frenzy of silk hankie dyeing with acid dyes towards the end. I stayed out of that – just too many ideas and things to try to take on another one!